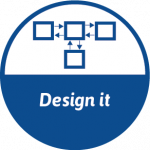 Value network design is the cornerstone of our value engineering approach to the digital transformation. In our approach, you start your exploration of new technology with the implications of new technology for your value network.Your business is embedded in a network of other businesses, and to understand and redesign your business model, you must understand and redesign this value network. 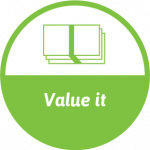 On this page we describe the way we model value networks, attach value to it, and evaluate its commercial potential. We represent a value network by a value model, which shows how businesses and consumers form a value network by commercial transactions. The following diagram shows a value model using the e3valueTM notation. It shows that customers can buy a product from a shop for money, and that the shop sells the product and a transport service to the customer. The shop, in turn, buys the transport service from a logistics company. The three stacked squares are sets of business actors called market segments. They are connected by commercial transactions. Commercial transactions consist of transfers of something of value, such as money, products, or services, from one actor to another. The bullet in the customer segment represents a customer need. The dashed line connects this needs with the transactions performed to satisfy this need. The bull’s eye in the logistics segment tells us that any other transactions to satisfy this need take place outside this value network. The e3valueTM technique is supported by freely available tools for creating and editing a model. Drawing an e3valueTM diagram forces you to specify explicitly who delivers what of value to whom. For example, when a transaction in the diagram does not contain reciprocal value transfers, then an actor provides something for which it does not receive anything back. That is not economically sustainable. The choice of partners in your value network and of the economic transactions you want to engage are influenced by your choice of technology. Once you have a value model, you can add your expectations about the economic value of the transactions in the model. A value model shows how actors perform transactions during a period that we call the contract period. You can quantify your value model by attaching estimated values to various diagram elements. For example, you can estimate how often customer needs will occur in the contract period, and what the money value of products or services will be. In the following diagram, the customer need occurs 50 times, the shops asks € 100 for the products and transport to the customer, and buys this transport for € 20 from a logistics provider. In addition, you can estimate expenses and investments needed to realize this value model. This depends on your technology choice and process design. Now that you have quantified your model, you can estimate revenue by for example a net value flow analysis. This tells us that in the contract period, the customer segment spends € 5000 in total, the shops have a total revenue of € 4000 and the logistics market of € 1000. The analysis can be refined by adding the value of the product for customers and shops, and of transport for each of the market segments. In general, net value flow computations can be complicated and our free software does it for you once you provided the monetary estimates. As a next step, you may want to know how sensitive your computations are to changes in market assumptions. This is part of risk assessment, discussed on a separate page.